On March 7, 1876, Alexander Graham Bell received a patent for his invention he called the “telephone.” Far from the device people today cannot seem to drive a car or eat dinner without, the original model did not even have push buttons or an LCD screen! No wonder people had a hard time adapting to the new technology. For example, how does one answer a phone? Invent something and a new problem is created. Bell’s answer to answering the phone was to loudly state a brisk, “Ahoy, hoy!” Really, no kidding. The guy that invented the telephone wanted us to answer in that peculiar way, reminiscent of nautical jargon. Mr. Burns, the character on The Simpsons television cartoon uses that archaic method of answering the phone. Since “Wadda ya want?” and “I’m on the other line” had not yet been added to the American patois, people began using the word “Hello,” a form of telephone answering generally accepted even to this day. Continue reading for more odd things people used to say. There are so many more of these words and phrases, perhaps you can add a list of your own. Questions for Students (and others): What old fashioned word or phrase amuses you? Is there an old-fashioned word or phrase you would like to see come back into mainstream use? This handy word used as a greeting and for answering the telephone did not used to mean what it does today. Prior to widespread use as a phone answering greeting, “Hello” was an interjection used when expressing surprise, astonishment, or the like, kind of like “Hey!” or “Wow!” or “Whoa!” If you watch the television game show, Jeopardy, you will notice host Alex Trebek often uses the word “Hello!” in just this manner. The earliest uses in American English literature appear from about 1826. This is the front cover art for the book Awful End written by Philip Ardagh. The book cover art copyright is believed to belong to the publisher, Faber and Faber, or the cover artist. We use this word to describe most of M. Night Shyamalan’s movies, or the quality of food we get from school cafeterias, in other words, something terrible or bad, especially really bad. Awful is also used to describe how we feel when we find out we won the Powerball lottery jackpot and some poor family did not. (Just kidding…) Back in the day, awful meant “awe full” as in something that is worthy of awe, or something extremely good or inspirational. Awful was also used to mean scared, afraid or terrified. Now it just means modern television shows. 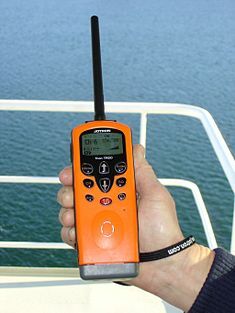 A handheld on-board communication station of the maritime mobile service. Photograph by Ulflarsen. Back in the Great Depression (something I never heard the end of from my mother and father who lived through it) most common working people had an ice box instead of an electric refrigerator. The ice man would come (cometh?) once a week, usually in a horse drawn truck (big cities, not just rural areas) with big blocks of ice for people to put in the top of their ice box. Folks had to drain the melted water from the bottom catch tray or else have a wet kitchen floor. In 1923, Frigidaire came out with the first home model of the refrigerator and the name “Frigidaire” became generic for refrigerator, something my grandparents and aunts and uncles often said when they did not say “ice box.” By the 1950’s the ice box was definitely obsolete, but the name stuck for many people that had grown up using it when referring to an actual ice box. Now that few of us have first hand experience with ice boxes, the term has largely faded away, though you still hear it every so often, especially by older people. (Is your refrigerator running? Better go catch it!) you might catch sight of the iceman on a rerun of the old Little Rascals movie shorts on television or in an old movie. 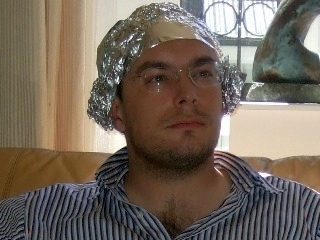 Man in a tin foil hat. Photograph by Drvec (talk). The function of sneezing is to expel mucus containing irritants from the nasal cavity. Photograph by James Gathany. 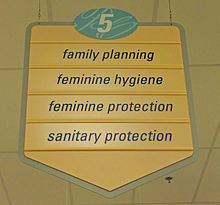 Sign in a Rite Aid drugstore using common American euphemisms for (from top) contraceptives, douches, tampons, and menstrual pads, respectively. Photograph by Daniel Case. Mister= Used to be used only when addressing one of superior social class that did not merit a higher title such as “Sir.” Today we usually refer to any man as Mister. Courtney, Gary. The Historic Cookson Hills Dictionary: A Collection of Old Time and Slang Words and Phrases. AuthorHouse , 2007. Earl, Rob. Dictionary of the Strange, Curious & Lovely: 3500 Most Beautiful English Vocabulary Words. Amazon Digital Services, 2019. MacFarlane, Robert. The Lost Words. Hamish Hamilton, 2017. Thrush, Catherine. A New Look at Old Words: Street Slang from the 1600s to the 1800s: A Writer’s Categorized Guide. Urban Realms, 2016. Weiser-Alexander, Kathy. Frontier Slang, Lingo & Phrases. CreateSpace, 2015. The featured image in this article, Bell’s drawings of early 1876 showing different designs of liquid transmitters were witnessed b numerous individuals who initialed Bell’s notebook, is in the public domain in its country of origin and other countries and areas where the copyright term is the author’s life plus 70 years or less. This work is in the public domain in the United States because it was published (or registered with the U.S. Copyright Office) before January 1, 1924.